Negativity is a health risk. It impacts your thinking and mindset and can lead to increased levels of stress, which in turn contribute to physical ailments including high blood pressure, increased heart rate, and headaches. It’s a vicious cycle. We don’t feel motivated. We feel depressed. We worry that we aren’t accomplishing much – or anything. It will take change – slow and steady change – to break the cycle of negativity and change your mindset. Doing so will change your life! An affirmation is a short positive statement that is true (or you want to be true). The process of repeating affirmations daily, either by writing or speaking them aloud, has a powerful effect on the subconscious mind. If you are new to affirmations, it is best to start simply and move forward steadily. 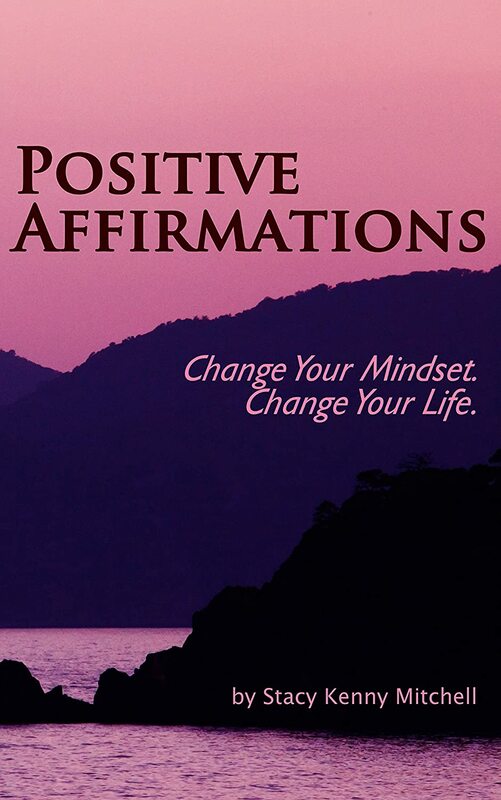 This book will help you develop a daily routine of reciting positive affirmations. With over 250 affirmations included, you’ll have a resource for finding the right affirmation for any segment of your life: friends, family, relationships, creativity, health, career, finances, your environment, and personal growth. I’ve used affirmations all my life, but only recently did I focus my attention on creating a list of positive affirmations that I recite daily. The experience has been life changing. My mindset concerning several areas of my life shifted and I was able to achieve amazing things, including eating healthier and writing this book! As this is a personal growth book – there are no characters. YOU are the central character. It’s YOUR life that can change by reading this book. Stacy Kenny Mitchell has a calling: to awaken the happiness and joy within each of us. She believes self-love, self-care, and selflessness are the trifecta to a happy and healthy life. She lives on the Lower Eastern Shore of Maryland with her husband and two children.